Although there have been no Class 60-hauled charters so far this year, 2017 has seen three locos make appearances at diesel galas. David Russell looks at the last passenger workings of the active fleet. OF the 100 Class 60s constructed by Brush at Loughborough between 1989 and 1992, some 25 examples – just a quarter of the fleet – remains in active service, with the remaining 75 stored. 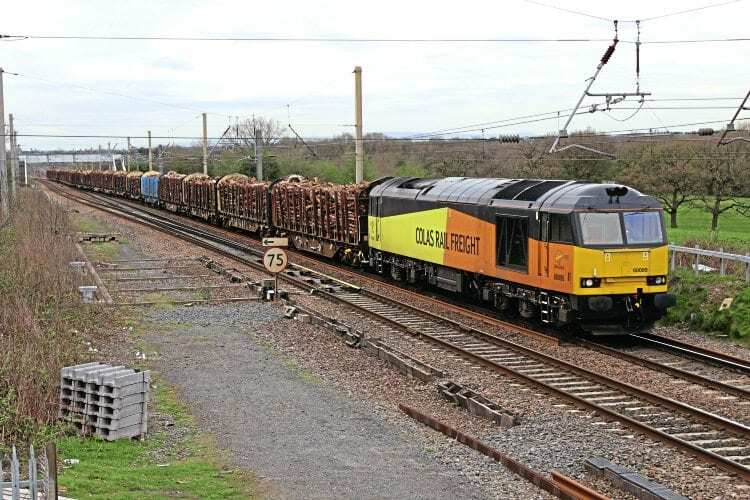 Of the active examples, DB Cargo operates 15 and Colas has 10, which were purchased from DB Schenker in 2014 and subsequently overhauled at Toton. Despite being built for freight traffic, all 100 Class 60s have appeared on passenger duties at some point, be it on charters, preserved railways or on timetabled services/rescues. The first recorded working occurred on September 28, 1990, when No. 60006 Great Gable rescued failed No. 47558 Mayflower at Horton in Ribblesdale while working the 2M17/10.47 Leeds-Carlisle. It was the following year that the first charter working took place, when Nos. 60032 William Booth and 60057 Adam Smith worked Hertfordshire Rail Tours’ ‘Coalville Swansong’ from St Pancras to Coalville on May 26, 1991. Later the same day, they hauled Pathfinder’s ‘Coal Scuttler’ from Coalville to Nuneaton. Neither of these latter two ‘60s’, which are both now in store, have undertaken any passenger work since – so any haulage fan who was not about on that day will still require them!